Simon has over 25 years’ experience of working with groups and individuals in a wide variety of settings from community care home to schools and local community. Added to this he has qualified teacher status and 18 years of teaching in local authority schools which means he brings with him an understanding of school and curriculum management as well as experience of a vast range of learning needs and styles. Completion of the National Qualification for Headship (NPQH) has added further to his understanding of the management and day to day needs of target driven organisations. 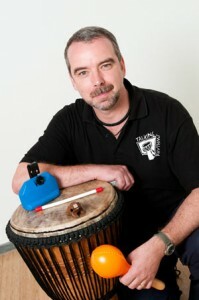 Having initial facilitation training with Arthur Hull, Simon’s open and honest approach is grounded in his facilitation style and he works with groups to develop a safe and encouraging environment within which to explore musicality and group dynamics. Through the past six years with Talking Rhythms he has successfully facilitated groups of half a dozen up to 200 participants with ages ranging from 4 to over 80 . He has worked in venues as varied as stables to one of Her Majesty’s Prisons and events as diverse as music festivals and church services. Ian Patterson Active Arts Countesthorpe.